News from LMCU: Congratulations Hutt Winners! 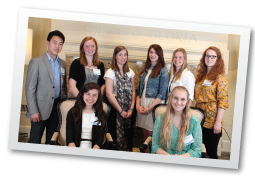 Our eight 2014 Hutt Scholarship winners were recognized and each awarded their $2,000 scholarships at a luncheon held in their honor at the Cascade Country Club on April 30. Pictured standing left to right: Johan Lee, Cambrynne Rietberg, Taylor Beukelman, Anna Dudzik, Morgan Swift and Victoria Essex. Seated, left to right: Nathalie Yanes and Alexandria Conner.